Sometimes, you just need comfort food. This weekend was one of those times. It was a great weekend–for my Valentine’s Day gift, Michael took the kids out for a while on Saturday, and I stayed home in the kitchen. I had a mini dance party where no one could watch or tell me “no dancy, mama.” I had three things going at once–bacon in the oven (please tell me you bake your bacon? It’s the best! ), a smoky apricot barbecue sauce on the stove, and chicken brining in the refrigerator. I trimmed green beans, and let my fingers switch to auto-pilot while my mind wandered. The days are long, but the years are short. I know that, soon enough, my heart will ache for someone to ask “sit-a-me, mama.” I’ll miss the busyness and the tiny voices talking FULL VOLUME ALL THE TIME. I do my best to capture the joys of this time. I take pictures of chubby wrists and dimpled hands, and little feet, and bright-eyed, messy-faced smiles. I “sit-a-them” and read piles of books several times each day, I get on the floor to play with toys and build block towers. I color pictures, and play in the backyard, and invite them to be with me in the kitchen when there’s something they can help with. But I also find this time of life really, truly exhausting on all levels a lot. I sometimes feel I’m riding The Feelings Rollercoaster along with my two-year old, and I do lay awake at night off and on feeling sure I’m failing them in some way (not enough art, music, science, natural exploring, physical activity, vegetables, vegetables, vegetables..). And some nights I go to bed deep breathing and praying till I fall asleep so that I can wake up and do it all again tomorrow. Valentine’s Day was the perfect chance to spend some alone time with the space I feel so connected to. 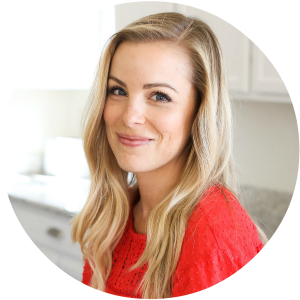 As I chopped, and stirred, and brined, and whisked, I loved knowing how happy at least one part of the meal would make each person feel. I loved surrounding myself with the smells and sensations of the kitchen. I crumbled the cooked bacon, tucked the chicken into the refrigerator to brine, and packed up the barbecue sauce for later. The green beans were set in a pot to steam, and I wiped the counters clean. I knew just what was missing (something sweet), so I poured a few pecans and a little maple syrup into a skillet and stirred over low heat. The syrup bubbled and thickened, sighing off the last of its steam and slowly caramelizing onto the toasted pecans. A little sprinkle of coarse salt, and the pecans were finished. I spread everything out to cool on a bit of parchment, and walked out of the kitchen right as the garage door opened, refreshed and feeling myself again. It may be chaotic, and harried, and stressful some days, but the kitchen is still my haven. And these are my people. 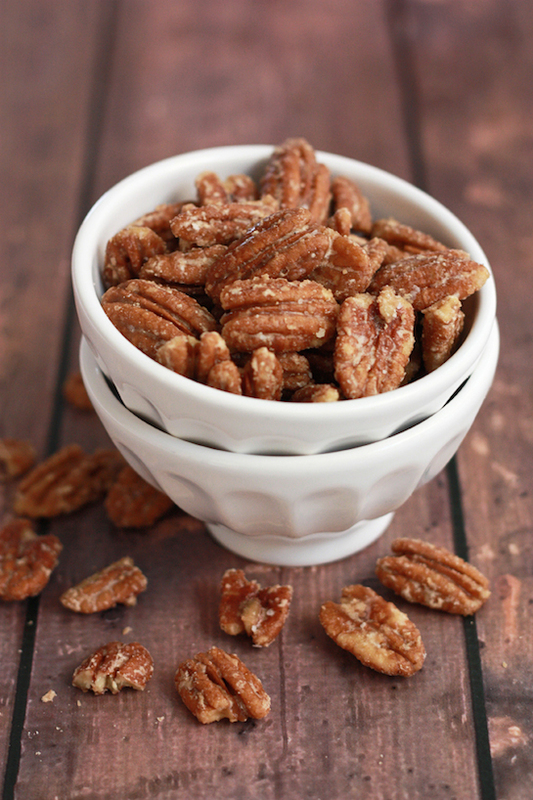 Place pecans and syrup in a skillet over medium-low heat. Stirring constantly, continue cooking the pecans and syrup while the syrup thickens and the water cooks out, about 5-7 minutes. 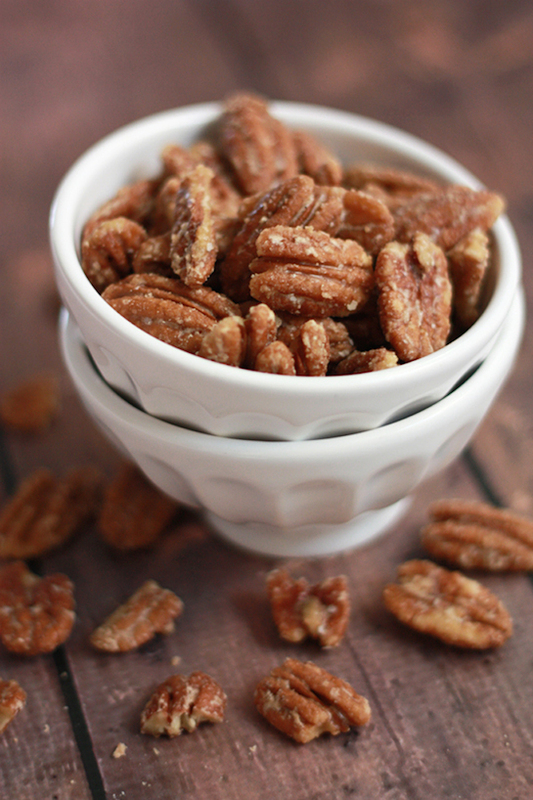 When the water is nearly all evaporated, sprinkle the salt over the pecans. When the water is evaporated, and the pecans are getting caramelized, spread the mixture out onto parchment paper or a silicone baking mat. Sprinkle with additional salt, as desired. Allow to cool completely (the syrup will continue to harden as they cool). Eat plain, or mix into your favorite salad, trail mix, or popcorn. What a beautiful post, Emily. Thank you for sharing your heart along with the recipe. I am right there in the trenches of motherhood with you and hear everything you say so clearly. Praise the Lord for the husbands we are blessed to be raising these little ones with. How did you know I love all things candied nuts?! These look amazing! I love your way with words! Motherhood sure is exhausting. Some days I’m not sure how I can do another day on my own (esp. being 9 months pregnant!) but somehow it happens. I’m not perfect but I love my kids more than anything and do my best. I know you are an amazing mom! So glad Michael gives you the breaks you need! Cooking and baking is relaxing to me too! From someone on the other end of the child rearing spectrum (my children are all adults) I too, remember being profoundly exhausted on a regular basis. Also, tossing during the night recounting what I could have/should have done differently during the day. let me confirm what I hope you know. This ‘mothering’ stuff is hard! Physically, mentally, emotionally, even spiritually, mothering pulls and stretches in painful ways some days. As a grandmother now, I don’t face exhausted toddlers very often. I don’t have anyone that throws their dinner on the floor. I’m not rushing out the door heading in a million different directions. In some obvious ways, life is much, MUCH easier. But, I also don’t get hugs or kisses or even smiles throughout the day either – which is totally sad! I’m cheering for all mothers of young children everywhere, who worry and work and give their all to the little people in their lives. THANK YOU mothers for not throwing in the towel and walking away. Some people DO give up! THANK YOU for not being those people. Your little ones are so blessed to have you!!! 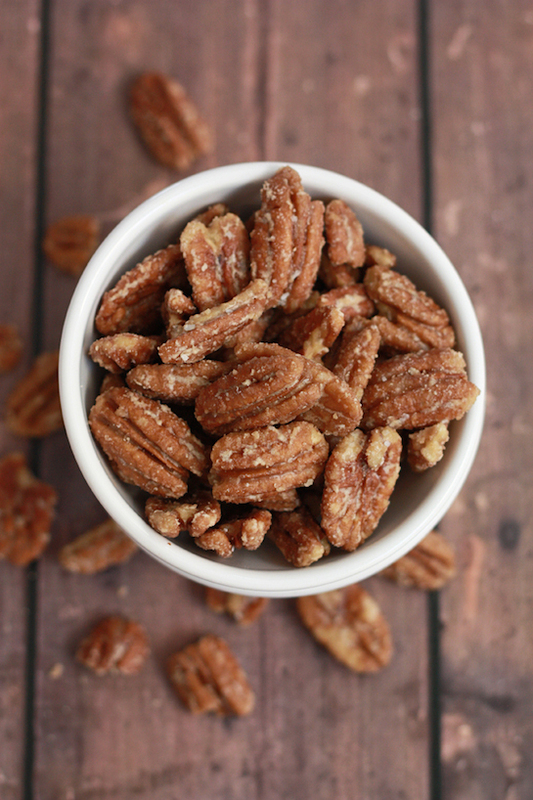 These nuts look yummy and so easy. I will have to try to make them this weekend. I loved your post and enjoy your blog so much. You are a wonderful mom so keep it up–and don’t worry about the vegetables. They all come around!